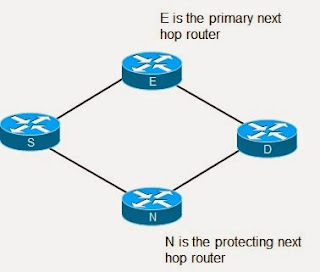 In the below topology, in case of failure of link between S and D, S will forward the traffic to A and A will again forward the traffic to S. The reason is very simple the cost of next hop from A to D will be lesser than the alternate path which is A-B-C-D-E. This will create a micro loop till the topology will converge. So answer is very clear, IP FRR is not the viable option in case of ring and square topology. Instead of LFA, Remote LFA is used when no Local LFA is available and is used to find a remote node which can reach the protected neighbor without traversing the protected link. Remote LFA is primarily used for ring and square based access topologies. In Loop-Free Alternates, the backup routes (repair paths) are pre-computed and installed in the router as the backup for the primary paths. Once a router detects a link or adjacent node failure, it switches to the backup path to avoid traffic loss. Remote LFA allows the backup next-hop to be more than one hop away. It means that after a failure an adjacent node recognizes it and tries to find a (remote) node whose shortest path to the destination is not affected by the failed component. If such node is found then packets will be forwarded to it. Remote LFA relies on tunnels to provide additional logical links towards backup next-hops. After the remote node receives the package it sends it towards to the primary destination. Note that the tunneled traffic is restricted to shortest paths just like “normal” traffic; hence the tunnel must avoid the failure as well. Now the question arises how to select the node which can be used to terminate the tunnel. B can’t be selected because it is ECMP for D. C can be the best suitable option to terminate the tunnel. Selection of C can be done by using P Space Q. The goal of IP Fast Reroute (IP FRR) is to reduce failure reaction time to sub-50ms by using a pre-computed alternate next-hop, in the event that the currently selected primary next-hop fails, so that the alternate can be rapidly used when the failure is detected. 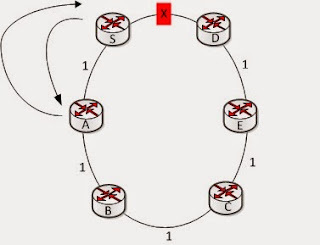 The alternate path or repair path must be loop free path to destination in case of network failures without recomputing the network topology as per below mentioned design. Repair path can be used for diverting live traffic flowing through the primary path protected by the repair path only if the repair path both bypasses local failure (for example, failing link) and does not cause traffic to loop. Such repair paths are called “loop-free alternatives” or LFA. 1. Loop Free Alternate:- Condition: D(N,D) < D(N,S) + D(S,D). Path is loop-free because N’s best path is not through local router.” Traffic sent to backup next hop is not sent back to S.
2. Downstream Path:- Condition D(N,D) < D(S,D). “Neighbor router is closer to the destination than local router.” Loop-free is guaranteed even with multiple failures (if all repair-paths are downstream path).